I’ve attended Feast Portland each year and this year I chose just one dinner to enjoy. I was hoping for a blogger pass to one of the showcases, but alas, I didn’t make the cut. 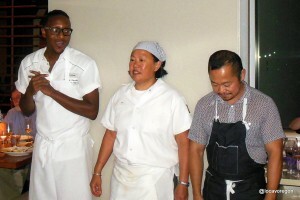 I was very happy with the dinner I purchased, the Thursday dinner with Chefs Gregory Gourdet, Anita Lo and Pichet Ong. I love lots of flavor and I’m not shy about loving salt. 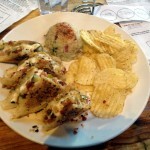 Every morsel they served seemed designed for my taste buds. It also helped that wine came from one of the wineries of which I am a member, Sokol Blosser, as well as a very good McMinnville winery, R. Stuart & Co. Plus, we had a very convivial table of interesting people. I will definitely be cheering for Chef Gregory Gourdet on this season of Top Chef. That wasn’t the case for one local chef whose food did not wow me. 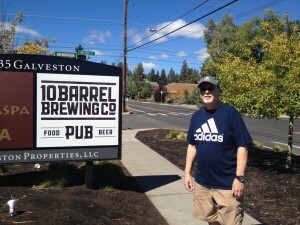 We finally made it to Bend, Oregon for a weekend of enjoying their great breweries and brewpubs. 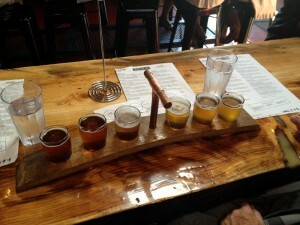 The first stop was at the Deschutes Brewery Bend Public House on Bond St. in downtown Bend. Arriving at 11:30 am on Saturday of Labor Day weekend, we were able to get a parking spot on the same block. I doubt that would be true for the rest of the weekend, despite the 2-hour parking time limit. It’s a big place and only half full when we arrived. By the time we left there was a line waiting to get in. 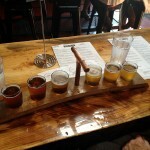 We had the 6-beer taster selection and a burger and a Reuben. We walked around downtown Bend for awhile until our time was nearing its end at the parking space. 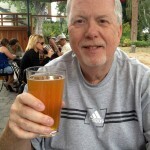 My Bend Ale Trail app led us to Bend Brewing Company nearby, so we parked and walked over there. 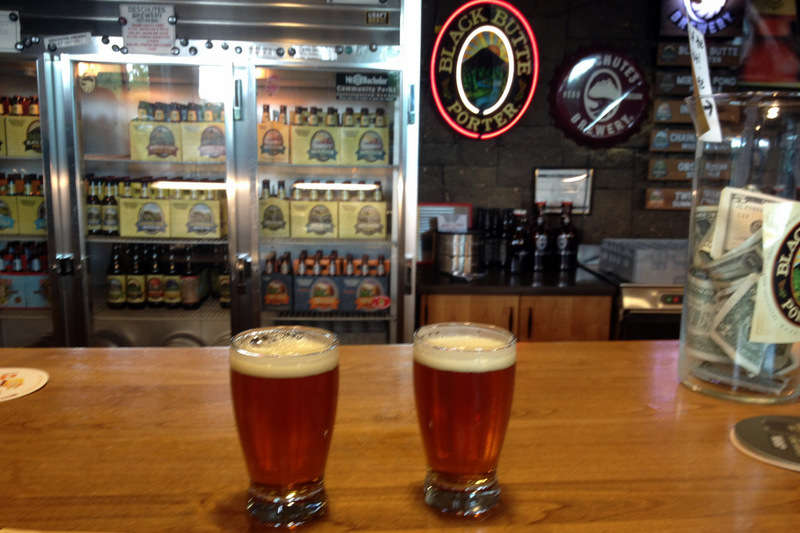 We had a glass of Elk Lake IPA and Metolius Pale, neither of which wowed us. It was nice to sit on the deck which almost had a river view. After more strolling around downtown, we checked into the Hilton Garden Inn at the old mill district. 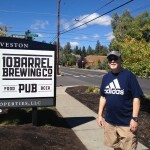 I chose the location as it was close to other breweries and yet also in walking distance of downtown Bend. A huge plus was the easy access to the great walking trails alongside the river. 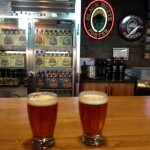 We strolled over the river to the main Deschutes Brewery tasting room as thunderstorms rolled in. We managed to dodge any real rain. The tasting room was very full and the staff was a bit harried. 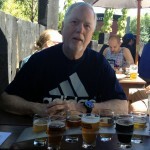 But we eventually scored the 4-sample tasting card and were able to enjoy Rich’s favorite, the rare Pine Drops IPA and the very good Inversion IPA, plus the River Ale and Black Butte Porter. Then a stroll back to the hotel. 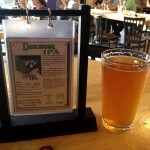 Come dinner time, we decided to go to nearby Crux Fermentation Project. We had a taster of 6 beers, including Polaris (OK), Half-Hitch (OK) , Outcast (OK) and Sugar Daddy (GREAT! ), plus their two Belgian styles which were OK. What was super duper were the sandwiches. The Ale Trail map said their Grilled Cheesy sandwich was a winner. It was more than that. I have to attempt to make it myself, but it would be hard to find the spent grain bread. What makes it great is an aged-asiago crust on the bread, a mixture of herbed goat cheese, provolone and pepper jack, with bacon and spicy pickles. Rich had the Chicken Bacon sandwich and it was also super. We split a glass of the Sugar Daddy. The place was as packed as you would expect for a Saturday night. Our server was delightful, very cheery and friendly, and doing his darndest to keep up. No matter that the food took awhile to come and the full glass of beer awhile as well, everything was worth the wait. I’d love to come back on a weekday during a slow time to enjoy more. 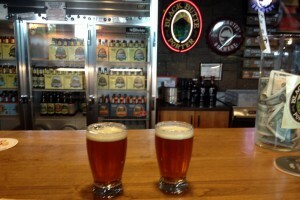 Sunday – we learned that two nearby places were closed on Sundays (Rat Hole and Brew Werks). We didn’t check to see if they made an exception for Labor Day Weekend. 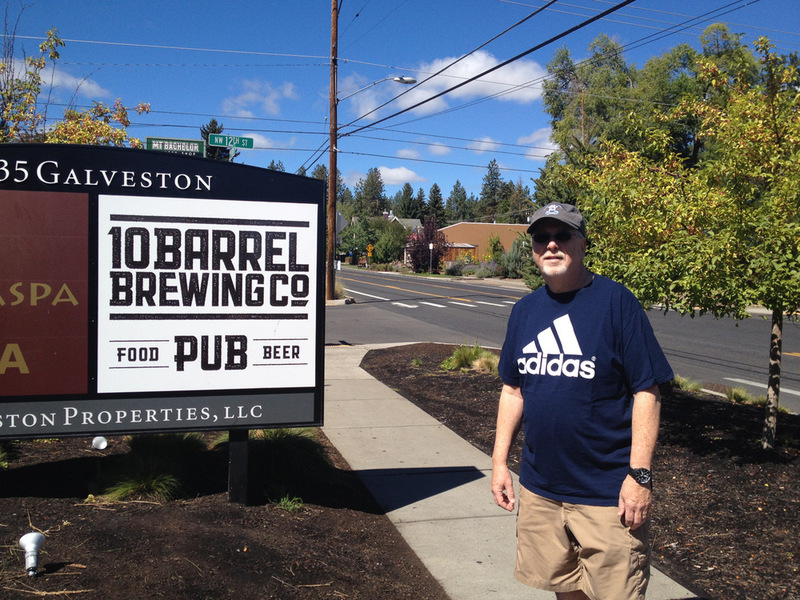 We enjoyed a nice 2-mile morning walk along the river and then a 1.5 mile walk to 10 Barrel Brewing. Lately we’ve been drinking their Apocalypse IPA at home. They have a great outdoor deck with a fire pit plus lots of tables shaded by umbrellas. Perfect. Their sampler includes the 10 beers they have on tap, so we sampled our way through all 10. After all, we had walked there! I have to say I loved their brewing style throughout. The Apocalypse tasted great fresh from the barrell. 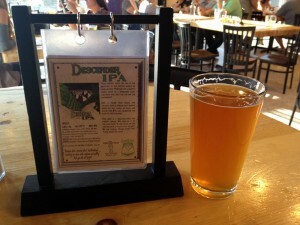 The OG Wheat IPA was amazing, who would expect a nicely hopped wheat beer? 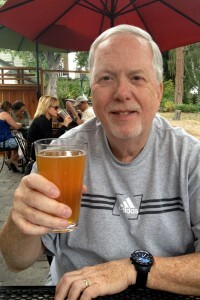 The Old School Pale Ale was great. Their Swill (a radler with lemon) was really delicious. We ordered a pizza and it was very good, and then had a glass of the beer we enjoyed the most. We strolled back to the hotel and enjoyed people-watching along the riverfront. 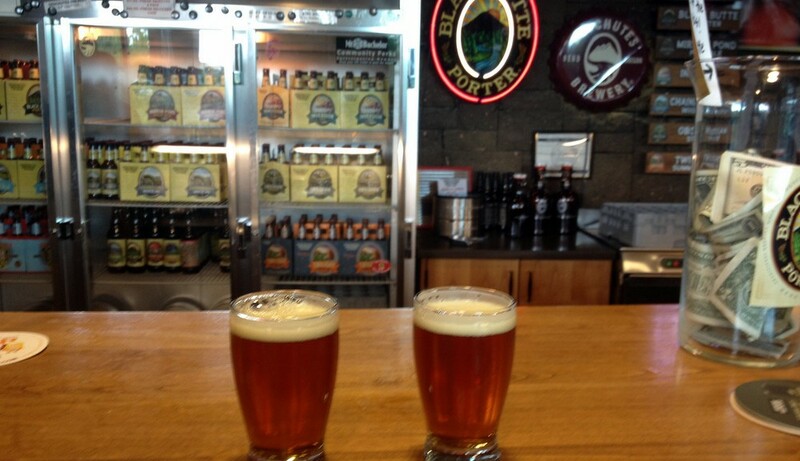 We were still full of pizza hours later, but decided on a visit to Goodlife Brewing. We enjoyed Descender IPA and the barman brought us a sample of the Comatose IPA. 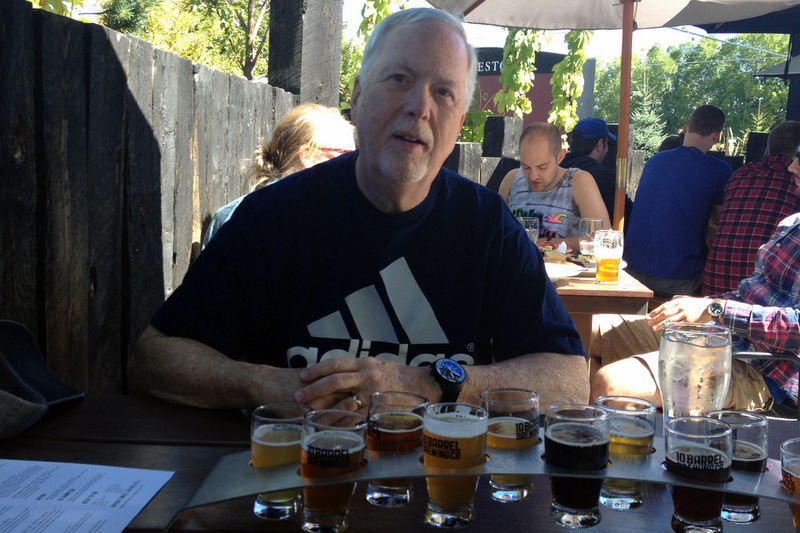 The beers were very good. 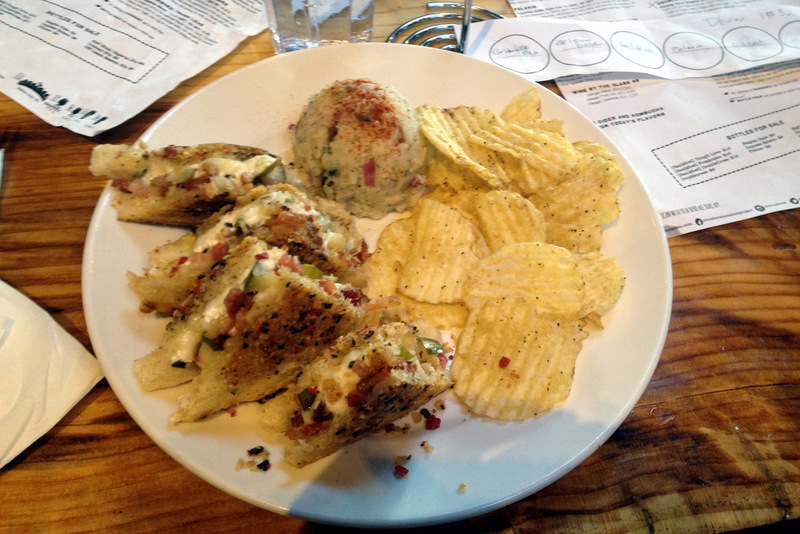 I wouldn’t go there for the food as the wings and bleu balls were just OK.
That was it for beer in Bend for us. We drove back alcohol-free on Monday. Along the way we were happy to find some Goodlife Descender IPA at Bi-Mart, so we look forward to trying it from the bottle on the safety of our patio. As we were walking, we noted some nice looking VRBO (vacation rental by owner) places along the river. Next time, it would be fun to rent a house or condo. The Hilton Garden Inn was fine, but it would be fun to have our own patio or back porch to enjoy a growler of Bend beer in the evening.